An improper golf swing can place extra pressure on your shoulder. Technically, you should never diagnose your own injuries. Only a doctor can properly diagnose a rotator cuff injury. That said, rotator cuff injuries are very common among golfers, so it is important that every golfer have some understanding of what a rotator cuff injury is and how to spot one. Rotator cuff injuries occur most frequently when a golfer is teeing off or making a long drive; however, injuries can occur at almost any time, even when you are not particularly exerting yourself. Be aware of any "pops" or cracking sounds in your shoulder area and any sharp pains in your shoulder or down your arm as you are playing. 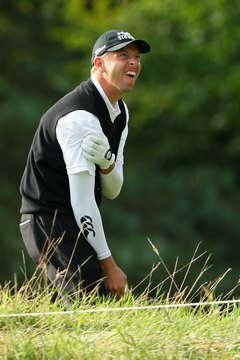 Be aware of any pains in your shoulders or down your arms, especially if you have felt or heard anything out of the ordinary, particularly while teeing off or making a long drive. Hold your arm straight out in front of you for a count of five. If you are experiencing sharp or acute pain in your shoulder and/or upper arm, you could have a damaged rotator cuff. Hold your arm straight out from your side, then bring your arm up until your hand is above your head. Again, any severe or dull, aching pains in the shoulder area that seem to get worse as you move your arm upward to your head could be signs of a rotator cuff injury. Comb your hair. The lifting and twisting motion put on your shoulder by the act of combing your hair will cause pain if you have a rotator cuff injury. Hold a 2-pound weight in your hand while your arm is hanging at your side, then raise your arm straight up and out to the side of your body. Hold the weight straight out from your body for a count of five. If you cannot do this because your arm is too weak or because your shoulder and/or upper arm is too sore, this could be a sign of a torn or weakened rotator cuff. If you suspect that you have a rotator cuff injury, you should see your doctor immediately. In some cases X-rays are required to complete the diagnosis.